Fresh white roses surrounded by regal sprays of silver and gold gave the ballroom of the Westin Convention Center an imperial flair Thursday evening for the Urban League of Pittsburgh's eighth annual Ronald H. Brown Leadership Banquet. The Pittsburgh league is celebrating its 85th year and was still basking in the glow of hosting a successful national convention in July. Urban League president Esther Bush kept things moving as promised when she welcomed 600 guests along with board chair Victor Roque and mistress of ceremonies Patrice King Brown of KDKA. The Post-Gazette's Ervin Dyer, KDKA's Olga George and WQED's Chris Moore accepted the Community Award for the Pittsburgh Black Media Federation. 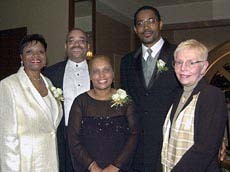 Pitt's Deborah Walker accepted the Civic Award, Joseph Guyaux received the Corporate Award for PNC Financial Services, and Sandy Phillips and Evan Frazier of Hill House Association accepted the posthumous award that went to its former director, James Henry. Murry Gerber received the Special Recognition Award for Equitable Resources. Applauding their accomplishments were state Rep. Jake Wheatley, Art Edmunds, Marc Cherna, Yvonne Cook, Volley Dyer, Ralph Papa, William and Ruthie King, Dr. Stephen Thomas, NEED's Sylvester Pace with Rhonda, Glenn Mahone, Larry Davis, Ron Davenport Jr. and WQED's George Miles. Move over eBay, Pittsburgh's Ohio Valley General Hospital Foundation's annual Auction Elegance was back in business Saturday night featuring everything from a mountain bike to the powder-room sink. Oval tables laden with bounty feathered the foyer of the Westin Convention Center's ballroom, bringing out the inner bidder in everyone. Especially after the two-hour cocktail reception, making it double the fun of just one. Terri Funwela and Lisa Plutto were part of the team handing out bid and table numbers as nearly 450 guests began to arrive, while chairs Dr. Ivan Baumwell (with Sybil) and Dr. Richard Bowers (with Miriam Rader) mingled. After the live auction and dancing, gaming tables were designed to keep guests gambling to benefit the Surgical Suite and OB-GYN departments. With 4,500 surgeries performed and more than 300 babies born last year at the hospital, they are ready for a renovation. Among those with paddles poised were board chair Richard Sica (with Kathy), hospital executive director Kimberly Murphy (with Chris), president Bill Provenzano (with Becky), Sandy and Bruce Tomlinson, John Kosar and Barbara and Ted Frantz. If those buzz words ring a bell, you're already a fan of WDUQ, Pittsburgh's jazz radio station. Tuesday the Urban Room of the Omni William Penn was alive with the sound of music as the Roger Humphries Quintet performed during a cocktail buffet and after a talk by DUQ director/general manager Scott Hanley and special guest Liane Hansen, host of NPR's Weekend Edition Sunday. The benefit supported the station's continued efforts to provide its listeners with comprehensive, international news coverage, commentary and jazz that cuts across the boundaries of time, space and style. DUQ hosts Tony Mowod, Alexandra Chaklos, Katherine Fink and Bob Studebaker were on hand, along with guests including Bob and Diana Bowden, Judge Larry Kaplan with Natalie, Ward and Shirley Olander, Fran Egler, Ronnie Bryant and Pam Golden from the Pittsburgh Regional Alliance, Maria DeMello and James Prozzi, Bill Nagle and Ron Sommer. What do you get when you match Sewickley wits with Vegas glitz? 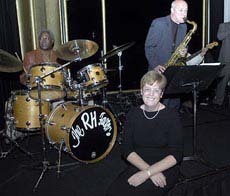 "CHAOS in Vegas," the Child Health Association of Sewickley's annual benefit ball and biennial play. Neon lights outside the Edgeworth Club evoked the legendary Flamingo Hotel, the backdrop for Saturday evening's feathered boa fun. Inside, the shocking pink and black color scheme helped guests time-travel to the days when Sinatra and the Rat Pack ruled. After a few drinks, the ultra-entertaining performance of the musical "Chaos in Vegas," written by Diane Tito (with Richard) and directed by Dolores (with Robert) Manuel, convinced guests a few neon nights were good for the soul. Among those calling in their markers for a marvelous time were co-chairs Merri Corbett (with Lee) and Lisa Burrows (with Charles), association president Bonnie Megan (with Lawrence), Marcia and David Gordon, Holly and Jay Miller, Susan and Greg Kaminski, the PG's Reg Henry with Priscilla, Pam Vaughan with John Sheehan, Pam and William Kredel, Judy and Robin Hetzell and musical director Joseph Domencic . Founded in 1906, the American Jewish Committee today has more than 120,000 members in 33 chapters including one in Pittsburgh. 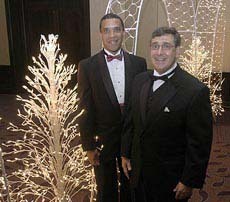 Tuesday it hosted the 2003 Appeal for Human Relations Dinner, honoring attorney Daniel Shapira for his contributions to numerous organizations including the University of Pittsburgh Cancer Institute, Pittsburgh Vision Services and the United Jewish Federation. A special tribute was also given to Shapira's late mother, Frieda Shapira, a longtime community activist who was remembered with a namesake orchid bred by the Bidwell Training Center and presented by Bill Strickland. Following dinner in the William Penn ballroom of the Omni William Penn, chairman Sy Holzer introduced keynote speaker David Shribman, executive editor of the Post-Gazette, who discussed the "great American birthright" of possibility. Mark Frank delivered the president's address and championed the efforts of the AJC to combat bigotry and advance the cause of human rights for all. Among the many friends and supporters who came to celebrate Shapira's achievements were his wife, Barbara, brother David Shapira with Karen and sister Edie with husband Dr. Mark Schmidhofer, Rabbi James Gibson, Ken and Lillian Goldsmith, Bernie and Marsha Marcus, Eddie Lewis, Ann and Alvin Rogal, Roberta and David Brody, Dr. Dennis and Linda Hurwitz, Charles Porter, Jack and Ellen Kessler, Bill Pietragallo, Roz Litman and AJC's David Shtulman and Gissa Weingartner. It was hip hip hooray for Family House Saturday night as former patients, families, friends and founders celebrated the 20th anniversary at the Hilton. A moving evening of stories recalled by the doctors and patients who relied on Family House kept the nearly 700 guests enthralled. Transplant surgeon Dr. Bartley Griffith came in from Maryland to introduce his former patient Brian Williams. Williams, now getting his master's degree, was the first person to be kept alive using a new machine while waiting for surgery. "We felt their stories were the real story of Family House," said board chairman Hoddy Hanna (with Mary Anne). 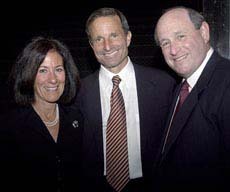 They co-chaired the event with Joan and Joel Ettinger. Past board chairs Gayland Cook, Ted Struk, Bill Copeland and Stacy Smith (who acted as emcee) all spoke briefly, Getting the 20-year Service Award were Ruth Blain, Jane Ellis, Gerry Silverman, Mary Struk and Sophie Vargo. Supporting the house that love built were Dr. Thomas Starzl (with Joy), Dr. Bob and Jackie Capretto, Jim Duratz, Tom and Ellen Golonski, Lt. Gov. Catherine Baker Knoll, director Cynthia Roth, Pat and Alan Siger and David and Susie Lovejoy.